Western Storm is all set to take on Surrey Stars on Thursday, July 26, 2018. Western Stars won their previous match. On the other hand, Surrey Stars failed to win the last match. In Today Dream11 Fantasy Cricket Match of WS vs SS, 5th T20, Women’s Cricket Super League, 2018, we will cover Pitch Report of College Ground, Cheltenham, Probable Playing 11, Fantasy Cricket News, Toss Prediction and Who Will Win? Who Will Win the 5th T20 Match, Between WS vs SS and Toss Prediction? Where Can You Watch the Live Streaming of WS vs SS, 5th T20 or Channels to Watch? Western Storm and Surrey Stars, both the teams have played one match each but the result for both the teams were different. WS won the last game whereas SS lost the last game. Both the teams have good players and they both have an equal chance of winning. According to our astrology prediction, SS will win the match. The team winning the toss should opt to bowl first as chasing will be easy on this ground. According to our astrology prediction, SS will win the toss and ask WS to bat first. Date: The match will be played on the 26th of July 2018 (Thursday). Match: Women’s Cricket Super League, 2018, WS vs SST, 5th Match. Time: 01:30 PM GMT, 07:00 AM IST, 02:30 PM Local. The pitch of Cheltenham, College Ground will be a batting-friendly surface. The seamers will find it difficult to take wickets on this ground but the spinners will get some help from the pitch. The spinners will get the turn as the game progresses. Overall the pitch will be assisting the batswomen and the spinners. It is expected to be mostly sunny in morning. It will be partly cloudy in the afternoon and it will remain the same throughout the day. The cricket fans and fantasy users can see the complete game as there is no sign of rain. The temperature is expected to be 29-Degree Celsius and the humidity to be 43%. WS and SS played three games against each other. 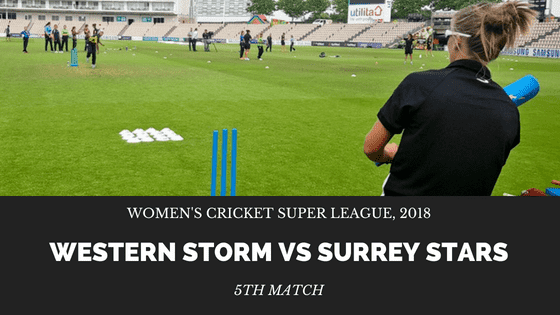 Western Storm won two matches out of three and Surrey Stars won one game out of three games. In the last encounter, Storm defeated Stars by 3 wickets with three balls remaining. Smriti Mandhana and Heather Knight are the key performers of Western Storm. WS won the last match against YD. This means that they will play with the same players until and unless there is any fitness issue. Heather Knight (c), Freya Davies, Fran Wilson, Stafanie Taylor, Claire Nicholas, Smriti Mandhana, Danielle Gibson, Rachel Priest (wk), Anya Shrubsole, Sophie Luff, Naomi Dattani. Rachel Priest(w), Danielle Gibson, Sophie Luff, Smriti Mandhana, Rebecca Silk, Heather Knight(c), Anya Shrubsole, Stafanie Taylor, Lauren Parfitt, Fran Wilson, Claire Nicholas, Naomi Dattani, Alice Macleod, Freya Davies, Amara Carr. Sophia Dunkley Brown and Dane van Niekerk are the key performers of the previous match. WS have defeated SS in the previous year’s Kia Super league Semi-Final. They will definitely try to make the equation equal. Hannah Jones may get a game today. Sarah Taylor (wk), Dane van Niekerk, Mady Villiers/Hannah Jones, Laura Marsh, Bryony Smith, Marizanne Kapp, Aylish Cranstone/Hannah Jones, Lizelle Lee, Grace Gibbs/Hannah Jones, Natalie Sciver (c), Sophia Dunkley Brown. Bryony Smith, Hannah Jones, Grace Gibbs, Lizelle Lee, Gayatri Gole, Sarah Taylor(w), Rhianna Southby, Natalie Sciver(c), Marizanne Kapp, Dane van Niekerk, Eva Gray, Sophia Dunkley Brown, Aylish Cranstone, Laura Marsh, Mady Villiers. Fantasy Cricket Expert Tips: Both the players are good. You can take anyone. 74.4% of the users have selected Sarah Taylor in their Dream11 Teams and 24.76% of the users have selected Rachel Priest in their Dream Teams. Make a combination of the above players for multiple teams. Conclusion: This is it for Today’s Dream11 Fantasy Cricket Match Prediction of WS vs SS, 5th T20 Match, which will be played on Thursday 26th July. We have covered all the details required to win any fantasy leagues.